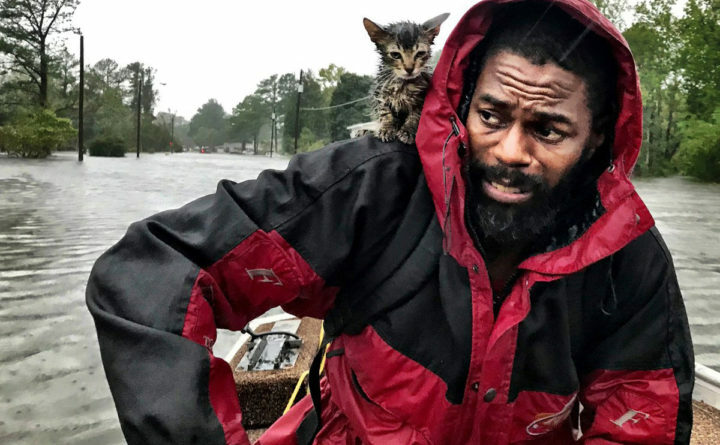 Robert Simmons Jr. and his kitten "Survivor" are rescued from floodwaters after Hurricane Florence dumped several inches of rain in the area overnight, Friday, Sept. 14, 2018 in New Bern, North Carolina. People aren’t the only ones being pulled from floodwaters in parts of eastern North Carolina inundated by Florence. Officials say hundreds of people in New Bern have been pulled from high water. The city said in its latest update Saturday that more than 100 people still required rescue and crews were working around the clock to retrieve them.